What exactly is a water shutoff valve and why is it so essential? It’s important to know where your water shutoff valve is to avoid water damage to your house. The water shutoff valve is a device to shut off the water supply to your home, operated by turning a knob, handle or lever. Use it when you are planning to take care of a DIY plumbing job, such as a faucet leak repair or toilet replacement, to prevent flooding. However, if even the words “DIY plumbing job” make you feel a little weak in the knees, don’t assume that you can just totally ignore this valve. 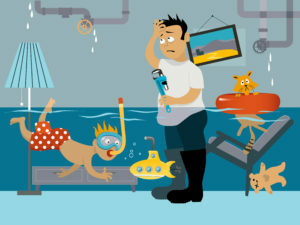 Everyone, even those not planning on doing a repair yourself, should know how to shut off the water in case you ever have a late-night plumbing emergency. You’ll find shutoff valves under your kitchen and bathroom sinks, next to your dishwasher, behind your toilet, near your washing machine, above your water heater, hiding in your closet ready to leap out screeching when you go to bed at night. These are good for stopping water flow in case of a small plumbing upgrade or repair. -Find out where each one is located. -Ensure other responsible household members know about them. -Keep them in functional condition with an annual spray of WD40 to prevent rust. -Learn which direction to turn them in (Hint: clockwise). The main water shutoff valve is the biggie. It turns off the water to your whole house and is the first place you’ll want to run if you have a plumbing crisis of the proportions described above. Memorize the location of your main water shutoff, which is usually where the water enters your house or next to your water meter. Fast action can save your home before water damage to your house and belongings occur. Never try to control your water pressure or rate of flow by adjusting the main shutoff valve. It must be kept either completely open or completely closed at all times. For convenient access, call Green’s Plumbing to install individual shutoff valves for any plumbing fixtures that aren’t already equipped with them. You never know when to expect the unexpected.